It was my sister who first discovered skinless and boneless chicken thighs. They're a brilliant find - excellent for stuffing, and when baked, they are so much more tender and flavoursome than the breast. They are also really cheap! They are available in both Sainsburys and Waitrose, but if you can't find them, either ask your butcher to skin and bone them or do it yourself. First, preheat the oven to 180°C. Then, using a mandolin, finely slice the mushrooms, courgette and garlic into a mixing bowl. If you don't have a mandolin, just slice the vegetables as thinly as you can. Then, add two teaspoons of crème fraîche, shred the basil leaves into the bowl and season with salt and pepper. Mix together all the ingredients and make sure the crème fraîche is evenly distributed. 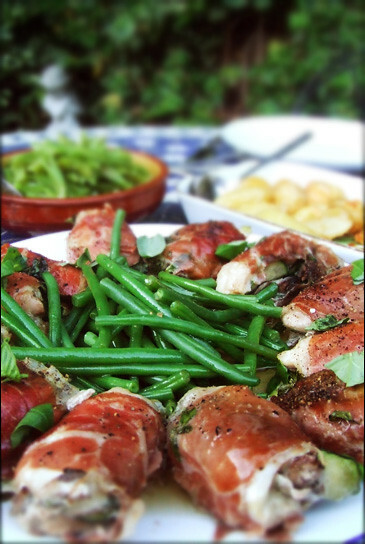 Open out the chicken thighs and spoon a couple of teaspoons of the vegetable mix into each one, then roll them back up and wrap with a slice of parma ham and transfer to a baking tray. Do this until you have used up all the parma ham and chicken thighs. Cover the tray with foil and then bake in the oven for 45 minutes. Leave to rest for 5 minutes after removing from the oven, then serve. I teamed this with fresh french and runner beans and roasted new potatoes.